Barbecue Doctor | No job is too small! The Barbecue Doctor is Arizona’s Outdoor Kitchen Specialist. 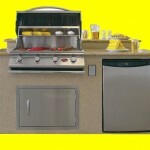 Barbecue Doctor Inc. can repair, clean, restore or replace any appliance in your outdoor kitchen. We have cleaned thousands of barbecues in the Arizona Valley. We service most cities, towns and municipalities in Maricopa County. We also service selective areas outside of the county. Please call the office to see if you are in the service range. At times, during a slow period, we will go outside of our service range to perform a service for a new or potential customer. We like to help people solve their outdoor kitchen problems. We service all makes of barbecues, patio heaters, fire pits, fireplaces (inside and out) and barbecue islands. We have a great varmint proofing service to keep pesky pack rats out of the barbecue. If we can get to all corners inside of the island, we may even keep them out of the bottom also. Explain your situation to us. The Barbecue Doctor will solve your problems. Let Barbecue Doctor perform a service for you. See why we are the preferred repairer for 12 grill manufacturers for warranty and non-warranty work.